The Redemption Triptych (P1888, P1889 P1890, P1891, P1892) consists of three scenes. The central one shows Christ on the Cross, with the Virgin and Saint John under an archway with Gothic tracery leading to a church. In the archivolts are depictions of different passages from the Passion of Christ, and the lateral jambs bear various scenes from the sacraments. 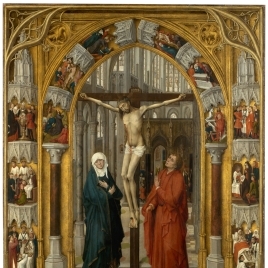 When the triptych is open, the lateral compositions present a similar layout, as both are set under Gothic pointed arches. The left panel shows the Expulsion from Paradise with various scenes alluding to the Creation in the arch´s orders. 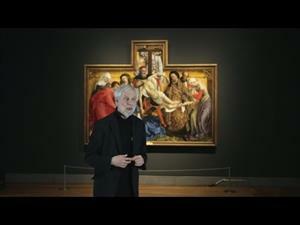 On the right, the Last Judgement is accompanied by small images alluding to different Works of Mercy. 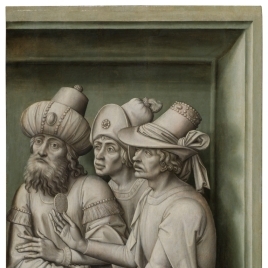 On the reverse of the triptych´s wings, the gospel scene of the Tribute to Caesar is represented in grisaille (P01890, P01892). 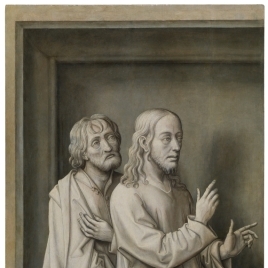 Maestro de la Redención del Prado closely followed the esthetic of his teacher, Rogier van der Weyden, with his customary layout of sculpted reliefs on the arches that frame the scenes. Unlike his teacher, however, Maestro de la Redención colors these groups, creating the appearance of polychrome sculptures. He uses the same human types, but is unable to endow them with the same elegant movement and profound drama of his master´s figures. In the sixteenth-century, the triptych belonged to Leonor Mascareñas, who was Felipe II´s governess. She donated it the the Convent of Nuestra Señora de los Ángeles, which she founded. During the Disentailment, it entered the Trinidad Museum, whose collection was added to that of the Prado Museum in 1872. Height: 195 cm. ; Width: 77 cm. Madrid, Royal Convent of Santa María de los Ángeles (bequest of Leonor de Mascareñas), 1564-1835; Trinidad Museum, 1835-1872. Cruzada Villaamil, Gregorio, Catálogo provisional, historial y razonado del Museo Nacional de Pinturas, Madrid, 1865, pp. 232. Lefort, P., Les Musees de Madrid. Le Prado, San Fernando, L'Armeria, Gazette des Beaux Arts, Paris, 1896, pp. 65-66. Lafond, Paul, Roger van der Weyden, Bruselas, 1912, pp. 59. Burger, Willy, Roger Van Der Weyden, Karl W.Hiersemann, Leipzig, 1923, pp. lám.51-52. Destree, Jules, Roger de la Pasture. Van Der Weyden., II, G.Van Oest, Bruselas, 1930, pp. lám.77. Gaya Nuño, J.A, El Museo Nacional, Boletín de la Sociedad Española de Excursiones, 51, 1947, pp. 61. Roggen, D., Le Siecle des Primitifs Flamands, Musee Communal des Beaux Arts, Brujas, 1960, pp. nº12. Friedländer, Max J., Early netherlandish painting, II, A.W.Sijthoff, Leyden, 1967, pp. 69. Cuttler, Charles D., Northern Painting. From Pucelle To Bruegel. Fourteenth, Fift, Holt Rinehart and WinstonInc, Nueva York, 1968, pp. 229. Sonkes, Micheline, Dessins du XVe siècle : groupe Van der Weyden : essai de cat..., Centre National de Recherches, Bruselas, 1969, pp. 133-134,164-167,203,211-214. Museo Nacional del Prado, Museo del Prado: catálogo de las pinturas, Museo del Prado, Madrid, 1972, pp. 778. Veronee-Verhaegen, N., L'Hotel-Dieu de Beaune, I, Centre National de Recherches Pri, Bruselas, 1973, pp. 70. Museo Nacional del Prado, Museo del Prado: catálogo de las pinturas, Museo del Prado, Madrid, 1985, pp. 657-658. Harbison, C., Jan Van Eyck. The Play of Realism, Reaktion Books, Washington, 1991, pp. 183. Museo Nacional del Prado, Museo del Prado. Inventario general de pinturas, Museo de la Trinidad, Museo del Prado, Espasa Calpe, Madrid, 1991, pp. nº990. Panofsky, Erwin1892-1968, Les Primitifs Flamands, Hazan, Paris, 1992. Buendía, José Rogelio, El Prado. Colecciones de Pintura, Lunwerg Editores, Madrid, 1994, pp. 366. De Andrés, G., Leonor de Mascareñas, aya de Felipe II y fundadora del convento de los Ángeles en Madrid, Anales del Instituo de Estudios Madrileños, 34, 1994, pp. 355-367. Les primitifs flamands et leur temps, La Renaissance du Livre, Lovaina, 1994, pp. 524-528. Réau, Louis, Iconografía del arte cristiano, Serbal, Barcelona, 1997, pp. 772. Finaldi, Gabriele, 'Fragmentos de género en la pintura religiosa del Museo del Prado' en Historias mortales: La vida cotidiana en el arte, Galaxia Gutenberg, Barcelona, 2004, pp. 134. García, Mª.C. Martínez, F., El Museo de la Trinidad: El taller de restauración y sus profesionales, Boletín del Museo del Prado, XXXIII, 2015, pp. 112-131 [117 f.2, 124 nt.63]. Spissu, Maria Vittoria, Permeabilità e specificittà / appropiazioni e identità (1455-1515 ca.) L' affermazione del linguaggio flandro-mediterraneo nel regno catalano-aragonese di Sardegna, Convivium, V / 1, 2018, pp. 185-200 . Catálogo Museo de la Trinidad, 1865. Núm. 990. Catálogo Museo del Prado, 1873-1907. Núm. 2192.